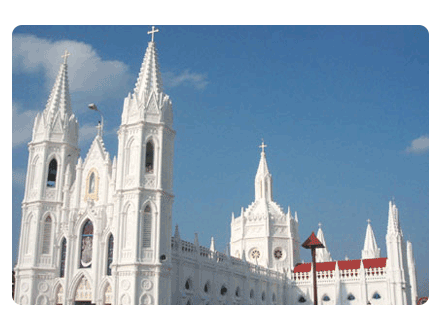 Velankanni (Tamil:வேளாங்கண்ணி), officially spelled as Vailankanni (Virgin of Velai, the town), also spelled as “Velanganni” (due to Tamil to English Transliteration), the world also popularly known as velankanni as “Lourdes of the East”, is a Parish under Tanjore Roman Catholic Diocese and a panchayat town in Nagapattinam district in the Indian state of Tamil Nadu. It is a small town located on the shores of the Bay of Bengal 350 km south of Chennai (Madras) and 12 km south of Nagapattinam on the Coromandel Coast, in Tamil Nadu, India. Once a port that traded with Rome and Greece, the tiny commercial center gradually lost its importance to the larger Nagapattinam. 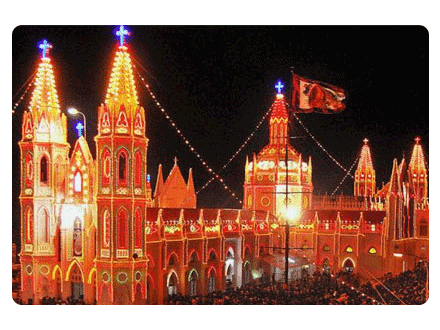 The name and fame of this international Shrine Basilica of Our Lady of Health, is founded on the three incidents that took place at three different periods in the 16th and the 17th centuries at Vailankanni.